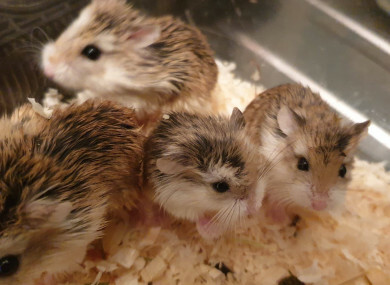 A PET SHOP in Newry has said it was “disgusted” when staff discovered that seven baby hamsters had been abandoned in a “filthy cage” in its car park on Monday. Pet Connection staff said they discovered the seven Roborovski Dwarf hamsters “surrounded by their own waste and exposed to the elements”. It is believed that the hamsters are from two different litters and all under the age of seven weeks, with the smallest of them weighing less than 10 grams. We are really disgusted at this callous act as these babies are so vulnerable. Pet Connection owner Roisin Morgan said this incident is a continuation of a worrying trend in which pets have been dumped in the car park of the Dublin road store. We are concerned about this trend of abandoning helpless animals, which is of course illegal under Section 14 of the Welfare of Animals Act (Northern Ireland) 2011. “This is the third incident of animals being dumped in the car park of our store…people continue to put these animals at unnecessary risk. “In previous years it has been litters of tiny, defenceless kittens, who just like these hamsters, were too young to have been taken from their mothers,” Morgan said. Roborovski Dwarf hamsters are not sold by Pet Connection, as they say, the hamster’s aloof characters and tendency to not enjoy being handled means that they are not ideal pets for most people. Staff at Pet Connection estimate that all of the hamsters will be ready to find a home in 1-2 weeks. “We operate successful rehoming schemes for many different species through our shop and we will always help people with unwanted pets if at all possible,” Morgan said. Email “'Disgusted at this callous act': Seven baby hamsters dumped outside Newry pet shop”. Feedback on “'Disgusted at this callous act': Seven baby hamsters dumped outside Newry pet shop”.